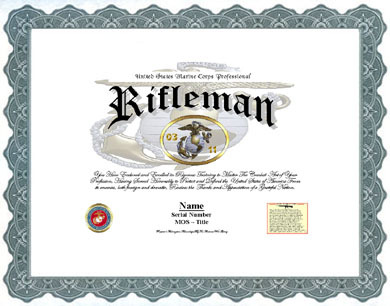 An unaltered photocopy of your DD-214 or other pre-arranged military issued document clearly displaying your USMC Rifleman primary or secondary MOS. The Marine Corps Rifleman is the basic combat assualt member tasked to deploy, engage, secure enemy territory by overwhelming, defeating or subduing all adversaries. 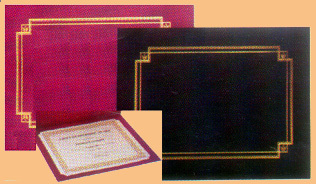 He operates as a team member or as a single, improvising unit. His has no other mission than to succeed. He employs the latest edition service rifle, grenade launcher and squad automatic weapon (SAW). USMC Riflemen are the primary scouts, assault troops, and close combat forces available to the MAGTF. They are the foundation of the Marine infantry organization, and as such are the nucleus of the fire team in the rifle squad, the scout team in the LAR squad, scout snipers in the infantry battalion, and reconnaissance or assault team in the reconnaissance units. Noncommissioned officers are assigned as fire team leaders, scout team leaders, rifle squad leaders, or rifle platoon guides.